It seems pretty certain that a statewide candidacy is in Mayor Parker’s future. LSQ: What’s next for you after your term expires at the end of 2015? There’s been a lot of talk that you will run for statewide office as a Democrat in 2016 or 2018. AP: I don’t intend to run for anything until I’m done as mayor. Unfortunately, in 2016, there’s not a lot out there, so I probably will need to go back into the private sector for a while, but I hope that while mayor of Houston is the best political job I would ever have, I hope it’s not my last political job. … I would certainly be interested in looking statewide. [I’m] not trying to be coy. People talked to me about running in 2014 as a Democrat for one of the statewide positions. I’ve had a lot of conversations with folks about that, but I made the commitment to serve as mayor of Houston and to do my best for the city for as long as I could. I just wasn’t in that place. I’ve also been fairly public that what I’m most interested in in terms of a future political position is something where I’m in an administrative or an executive position. [With] due respect to my members of Congress down here, I’ve been the CEO of a $5 billion corporation. I like to get things done, and the idea of, say, running for Congress, doesn’t excite me. … [It will be] a statewide executive position. I know the inauguration was just yesterday, but hey, it’s never too early to speculate, right? So let’s consider the possibilities for Mayor Parker’s future as a statewide candidate. US Senate: I’m sure there will be no shortage of people willing to take a shot at Ted Cruz in his first run for re-election, assuming he isn’t elected President in 2016 or named Beloved Leader For Life following a coup. However, if we are to take the Mayor at her word when she talks about preferring a “statewide executive position”, then it seems safe to say that she will not be among those queuing up for the opportunity. Governor: The obvious choice, for all the obvious reasons. However, there are two obstacles here. One is the possibility that in 2018 Governor Wendy Davis will be running for re-election. One presumes that the Mayor would not be anxious to primary her. Two is the possibility that her mayoral colleague from San Antonio, Mayor Julian Castro, will be ready to throw his own hat in the ring for this race. That’s not the same as primarying an incumbent Governor, but while we are miles away from anyone having a claim to that nomination, it would not be ridiculous to decide that one’s odds are better in another race. Putting it another way, I can imagine one of Mayors Parker and Castro running for Governor in 2018, but I cannot imagine both of them doing so. If I were Mayor Parker and I had my hopes pinned to a Governor’s race in 2018 (assuming Wendy Davis doesn’t win or chooses to serve only one term, of course), I’d probably make a point of whispering about the prestige of the US Senate and the joy of serving in the upper chamber while his brother makes his mark in the House in Mayor Castro’s ear at any opportunity that presented itself. Lt. Governor: At first glance, this doesn’t feel like a fit, since unlike the Governor, the Lite Guv is heavily involved in legislative activities as the presiding officer of the Senate. However, Mayor Parker presides over Council meetings and is directly involved in crafting legislation for the city, so it’s really not that much different. I doubt she has this in mind, but it’s not out of the question. Comptroller: Probably the first office that comes to mind for some people, given the Mayor’s background in finance and her tenure as City Controller. My guess is that this is the office she was encouraged to file for in 2014. A good fit, and a good landing place if Mayor Castro doesn’t take her advice about running for the Senate. Attorney General, Ag Commissioner, Land Commissioner: Mayor Parker is not an attorney, and is thoroughly urban, so neither of the first two are plausible. Land Commish is at least a remote possibility – former El Paso Mayor John Cook is running this year, so it’s unremarkable for an urban Mayor to compete for this post – but highly unlikely. If she’s not running for Governor, I can’t see her choosing anything other then Comptroller. Railroad Commissioner: The one office she could run for in 2016, if she hadn’t already ruled out running in 2016. Again, this would be a good fit given the Mayor’s background in energy back in her private sector days plus the fact that if any city is associated with energy in Texas, it’s Houston, but again, at best a remote possibility. It’s Governor, Comptroller, or bust. One last office to consider, if Mayor Parker decides that running statewide is too much trouble and she’d just rather serve in an office that allowed her to live in her own house, and that’s County Judge. This assumes that Judge Emmett decides to call it quits – assuming he is re-elected, of course – and if that happens, then given the historically good relations the city has had with Harris County during her tenure, Mayor Parker would be a logical and sensible successor. I’m just throwing this out there because crazy speculation is one of the perks of being a blogger, but you have to admit there’s something to it. If she changes her mind about running statewide, which I am not encouraging her to do. (PDiddie thinks this CultureMap story suggests ambivalence on her part, but I think she’s just saying she has no plans for 2016, as she has said all along.) 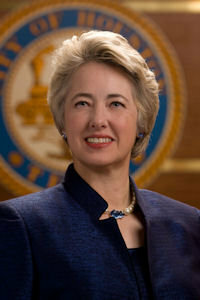 What do you think Mayor Parker might do down the line? Leave your own crazy speculation in the comments. Great post, and it’s good to see a reasoned approach to all of the options. The Democrats for 2018 are going to be a very interesting chess board, none of which falls into play until after this year’s elections. I suspect that Parker, being a very logical person, is perfectly content to let the 2014 chips fall where they may, and see what shape the party is in. Texas will have many bright prospects in 2014, with the Castro brothers possibly running for 2 statewide offices. If Davis and Van De Putte prevail this year, those spots would already be taken. But Parker is the clear standout with experience for Comptroller… she’s above and beyond the other high profile Democrats for that position. The other plus about Comptroller? Because it’s such a technical job, it won’t leave much room to stoke fear about Parker on social issues. It’s a much more cut-and-dry world than all of the mantra and hoopla that have to encircle a Governor, Lt. Gov. or Senator. Of course we all hope that by 2018 the attitudes of Texans will have shifted enough to not be afraid of an openly LGBT candidate. If Davis does not prevail, I would love to see Parker run for Governor. If Parker does run for comptroller the Republicans will shrill to the high heavens about every single social issue. It won’t matter a lick that the comptrollers position has no sway/impact in the area of social issues. Republicans would shrill about these things even if the city/state head dog catcher was an elected position and any Dem was running for it!